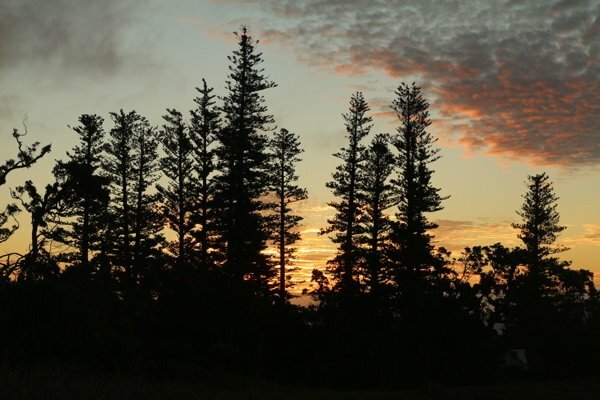 This group of 12 Norfolk Island pines is growing on the Farm Terraces on the northern side of Raoul Island. They were planted by Tom Bell, who settled the island with his family in 1878 (an account can be read in 'The Crusoes of Sunday Island' by Elsie K Morton). He acquired the seeds from his friend, Governor George Grey. 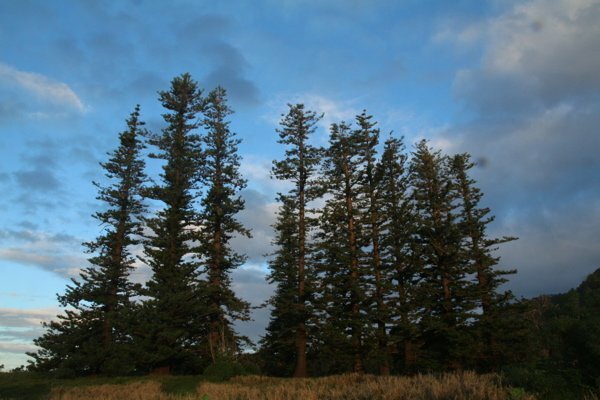 A painting of his settlement made in 1892, by RWI Carver, shows the row of Norfolk Island pines with 7 tiers of branches so the likely planting date would be around the year Bell settled on the island. While the trees have so far been protected for being of historic significance, their future is uncertain. They do pose a biodiversity risk to the native forest, as they produce many seedlings. Also, they grow close to the end of the island's emergency airstrip, limiting the weather conditions which aircraft could land if a medical evacuation of Department of Conservation (DoC) staff was needed. For these reasons, DoC plans to remove these trees. The largest tree in the group can be seen on record AR/1120 (Maloney, A.D. 2013). Read a history of Raoul Island by Dr J Floor Anthoni, 2002. In good health considering the extreme environment. 09 Aug 2013 Maloney, A.D.